The Château Barateau vineyard existed in the 18th century. Abbot Barateau, priest of Saint-Laurent, came in 1820 to bless the first stone of this winemaking estate. The owners of the time took the blessing to the extreme, giving their château the churchman's name. The service of wine has remained its only creed over the years. The vineyard, planted on a good chalky-clay south-facing hilltop, is on the road to Saint-Julien. This nicely structured wine attracts the attention of all enthusiasts. Its straightforward aromas, fully blending after five years, make it one of the good Saint-Laurent crus. This vintage, the quality regularity in recent years is often cited as an example of the kind of products Haut-Médoc, has an impressive list of medals as three silver medals for the 2010 vintage. 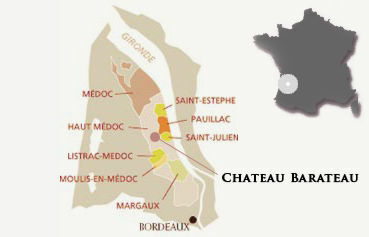 The Château Barateau accesses to date forefront of best of the appellation. Château Barateau is on side of a hill, providing it with plenty of sun, at a crossroads of the road linking Saint-Julien to Saint-Laurent, after Châteaux Lagrange and the Tour Carnet, and the national highway linking Bordeaux to Pointe de Graves. A second land on the Saint-Sauveur near Pauillac plate was acquired in 1989. Area: 24 hectares (12 hectares in Saint-Laurent and 12 hectares in Saint-Sauveur), Grape varieties: 48.3 % Cabernet Sauvignon, 2% Cabernet Franc, 47.8% Merlot, 1.9 % Petit Verdot. Average age of vines: 24, Soil: Chalky clay in Saint-Laurent and gravelly sand in Saint-Sauveur. Density: 6500-8000 vines per hectare. Vineyard management: tillage, weeding or weed / manual / stripping / budding / partial green harvest suckering. Harvest: Mostly with mechanical sorting table at the reception harvest. An average of 160,000 bottles a year.